This week, a client of ours experienced their IIS Application pool crashing, and this occurred several times during the week. For months they could not figure out what was causing the problem. We could not reproduce it either. So the first step was to attach ADPLUS to the IIS process that was crashing, and then configure ADPlus to catch the specific exception we were having. 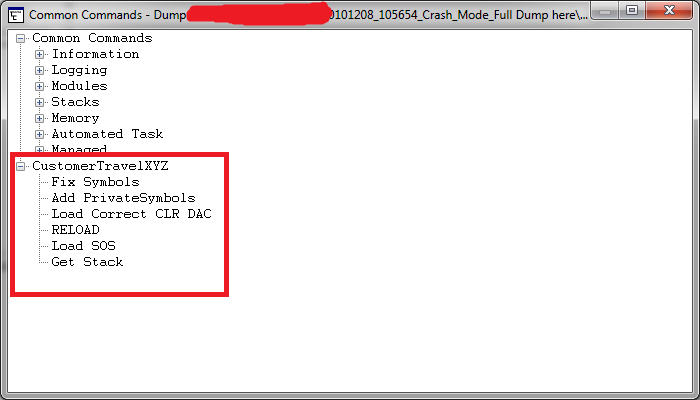 The only clue we had in the event log was this exception code, without any additional information, except that the Kernel.dll was involved. I then configured ADPlus to catch this type of exception, this is crucial, else it would catch other exception types and the dumps generated will not be the ones we need, so a filter with a config file is used! Note I am using AdPlus verson that requires version 2 attribute in the header and the schema has changed since the previosu version. The one we want to check out is the first one, since it managed to find the 0xe053534f exception that I was concerned about, and I was sure this code is a stack overflow, but lets go find out! Before I get started with WinDBG, I created this file template, since I copied the symbol files and private pdb files to my local laptop, I also needed the DAC for CLR (mscordacwks.dll) on my machine, which is the version from the server. This is clearly a repetition of method calls on the stack, and is overflowing it. We can see a bug in the MVC Account Logon controller, so the developers will need to fix logon retries etc. from here I can Dump Objects related to the username that caused the problem. I can see this user is always in the stackoverlfow, this method call with these parameters are repeated. Why??? This exception does not seem to be the real thing, has nothing to do with the user, lets get this exceptions nested exceptions. Why, since the above SQL would not cause an IIS crash, it is just a SQLReader getting zero results and the code is not dealing with a null. Message: Your BLAHNo is not currently active with Attribute2. The BLAHNo from the !clrstack –p and then the !do on the parameter confirms this e.g. Hoe you find this useful. I omitted allot of the output as there were about 130 of the same method call patterns on the stack.